Yesterday, Tanya and Dave started their weight loss challenge. 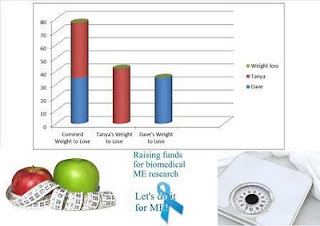 Here, Tanya explains why…..
‘Our daughter Tara fell ill with M.E. in November 2010, when she was just 10 years old. Since then she has been unable to attend mainstream or medical school. This led us to make the difficult decision to de-register her and we will begin home-schooling ourselves when she is a little stronger and able to concentrate enough to take short lessons. As a family our lives have dramatically changed since this illness, Tara has two older sisters who find it very difficult to see her in pain and unable to join in with them. They try not to go on about their social lives in front of her because they feel guilty being able to do all the things Tara should be able to do too. However, Tara never complains and always sees the bright side of any situation, no matter how hurt she feels inside. She suffers from chronic pain, headaches, dizziness (blacking out on occasions), regular sore throats and swollen glands, nausea, noise sensitivity and can’t manage large social gatherings due to the sensory overload and exhaustion it causes. These are just a few of her symptoms – there are many more! She needs to take various medications to help her control her symptoms and misses life as it used to be. Tara used to be such an active child. Always on the go, singing all the time and dancing her way around the house. She attended tap and modern dance lessons, musical theatre and also dance groups at school. Nowadays we use a wheelchair for when we go out as a family, as Tara can’t walk too far due to exhaustion and the pain it causes in her limbs and back. She struggles to sing and if she does, it’s at a whisper as the strain of it hurts her throat. Although at the moment her activities and social life are limited and have to be managed very carefully, she is able to maintain friendships. Sadly the number of her friends has dwindled as it is difficult for her to participate with them as a “normal” child would, she can’t go roller skating, swimming or mess about in town with them. 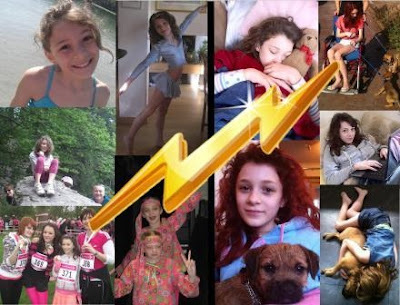 BUT the friends she does have are extremely supportive and loyal and understand that she is limited in her activities and pop in after school for 10 minutes to say hi – or visit for a couple of hours at the weekend to dress up or watch films together. We have no idea what the future holds for Tara but we are positive and pro-active in her care, always looking out for new treatments and medications which may help her. We are currently following a regime with both the Children’s Hospital and an Osteopath/ME Specialist. At the Hospital we utilise the skills of the Consultant, Physiotherapist, Occupational Therapist, Clinical Psychologist and Pain Clinic. We attend Hydrotherapy for half an hour once a week with the Physiotherapist and Occupational Therapy Group meeting for an hour once a week. We have regular review sessions with the Pain Clinic, Clinical Psychologist and Consultant too. The Osteopath/M.E. Specialist has just started treating Tara using the Perrin Technique and is herself an M.E. sufferer. As a family we’ve had to make a number of adjustments and it hasn’t been an easy ride so far. During this time Dave and I have both gained some padding and now we feel in the right frame of mind to address this BUT wanted to do something to help Tara and other sufferers at the same time. Invest in M.E. 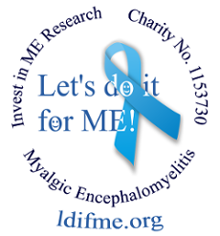 is a fabulous charity with a great vision for M.E. patients. 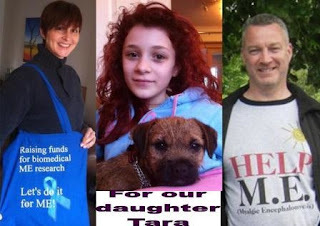 We want to help raise funds for them to achieve this goal and help support not only Tara, but all the children and adults whose lives have been so drastically altered by this devastating illness. I have a whopping 42lbs to lose and Dave has 35lbs to go – so in total we aim to lose a combined weight of 77lbs by August! 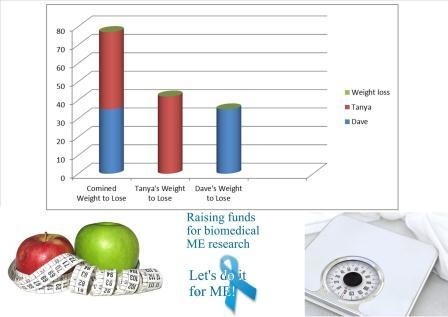 We are starting our diet today – Saturday 28 January we hope to lose pounds whilst raising pounds for Invest in M.E. help us raise its profile and the need for more research and funding into this area.